The 80's brought us animated action with He-Man and the Masters of the Universe, Thundercats, and the mighty Transformers, whilst prime-time TV was dominated by vehicular action in the form of Airwolf, and Knight Rider. 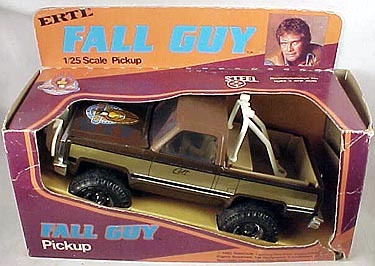 But 2 shows which had the truck, rather than the car, as their star were The A-Team with Hannibal, Face, Murdock and Mr.T and Lee's follow-up hit to The Six Million Dollar Man, The Fall Guy, with Colt Seavers, Howie Munsen ansd Jodie. Whilst less prolfiic in numbers, The Fall Guy, produced it own and varied range of merchandise through puzzle books, lunch boxes, board games and the other usual suspects, but it was Colt's truck, the classicly customised GMC 4x4 that was the predominate item. It came in kit form, from ERT, in several scales of die-cast metal from a couple of inches long to a much larger foot-and-ahalf model, which came with a small figure of colt, to stunt playsets and even a scaletrix set. Whilst the show had 3 human leads, in the form of Colt Seavers, the stuntman and part-time bounty hunter, his helpful but bungling cousin Howie, and the Colt's gorgeous assiatnt/stuntwoman, Jodie, most of the merchandising products were centered around the trucks/stunt action. 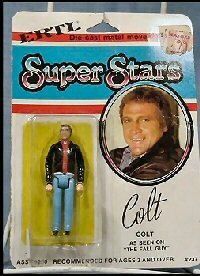 There was a three-and-a-half Colt figure [see left], but nothing for Howie or Jodie [stunt-Barbie, anyone?] and no 12" figures, which is a shame, considering the popularity of the series and the fact that it lasted 5 years. Whether sales or marketing exces didtated the direction of the toys is difficult to say. Jodie did get a white converatble vehicle released, but that was it. Considering the limited appeal of the show to a young female audience, this is maybe not too surprising. Today, many of the popular items turn up on the auction site eBay and can be picked up at quite resonable prices, although trying to find a complete list of merchandise is next to impossible. 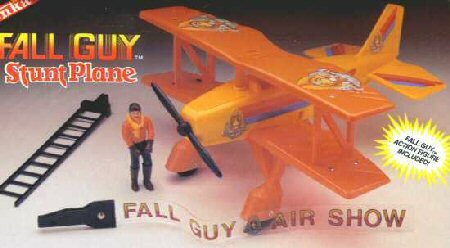 Rarer items don't turn up very often and whilst there are several sites devoted to 80's toys, most sEem to neglect 'The Fall Guy', in favour of more popular cartoon fare.